5/4 Cup of Coffee: The lower levels saw a ton of offense, as the Drive and Red Sox scored a combined 24 runs on Sunday. Things were not as positive in Pawtucket, where Brian Johnson faltered for the first time this season. The Sea Dogs rallied behind Jantzen Witte's big day at the plate to score twice in the ninth, but were unable to grab the win. Brian Johnson came into Sunday's game leading the International League in ERA with a 0.86 mark, but after allowing seven earned runs in 2 2/3 innings against the Bulls, Johnson's ERA jumped to 3.42. Johnson's command was missing from the get-go, as the lefty allowed a double to the second batter of the game and allowed him to score on two wild pitches. He would end the day with three wild pitches, and five walks. Three of the Bulls' six hits off Johnson went for extra bases. The start was Johnson's worst, both in terms of innings and runs allowed, since he gave up seven runs in 2 1/3 inning last July for the Sea Dogs. After Johnson exited, the PawSox bullpen did an admirable job, with Robby Scott tossing 2 1/3 scoreless innings, and Dana Eveland and Zeke Spruill both contributing scoreless frames. On the offensive side, the PawSox were unable to get much going. Jackie Bradley Jr. continues to hit well, going 2 for 4, his fourth multi-hit game in a row. Despite scoring twice in the top of the ninth to pull within one, the Sea Dogs were unable to complete the comeback. Jantzen Witte had a huge day at the plate, going 4 for 5 with three RBIs. His hits included two doubles and a solo home run to left-center field. He was also responsible for driving in the two ninth-inning runs for Portland, hitting a two-out double. Keury De La Cruz had one of the other two RBIs for the Sea Dogs, going 1 for 4 with a double. Starter Luis Diaz allowed eight hits and four earned runs over his 5 2/3 innings of work, walking a pair and punching out five. Diaz took the loss and dropped to 0-2, and he owns a 5.82 ERA and .311 batting average against in his 21 2/3 innings this season. The bats were out in full force for the Red Sox, as 2014 second-rounder Sam Travis went 3 for 5 with three RBIs and shortstop Tzu-Wei Lin drove in four with two hits. Lin, Travis, Jose Vinicio, and Franklin Guzman had a double apiece, and left fielder Aneury Tavarez hit his second triple on the year. Forrestt Allday continues to reach base at a ridiculous clip, boosting his OBP to .537 with a hit and two walks on Sunday. Ty Buttrey was wild in his first start since being promoted to Salem, but minimized the damage, allowing three runs on six walks and six hits. All of the runs against Buttrey came in the top of the third, when he faced nine batters and allowed three hits, three walks, and worked around an error. Rafael Devers led the way in Greenville's 18-hit attack, going 5 for 6, clubbing two doubles, two home runs (his first two of the season), driving in five runs and scoring four times. Four of Devers's RBIs came with two outs in the inning. Behind Devers in the order, catcher Ben Moore had a nice day, going 3 for 5 with three doubles and a couple of RBIs. Javier Guerra reached base five times with three hits (including a double) and two walks. Left fielder Derek Miller had two RBIs on a hit and a walk, and second baseman Mauricio Dubon reached with a single, double and a walk. Jamie Callahan gave up seven hits, three walks and four earned runs over his four innings of work, striking out just one batter. Chandler Shepherd, a 22-year-old righty, picked up the win for Greenville, tossing three innings of one-hit ball. Shepherd has been very solid for the Drive in relief, posting a 1.46 ERA in 12 1/3 innings, permitting just two earned runs, 11 hits and three walks (one intentional) while striking out 12 and holding opponents to a .224 average. Mario Alcantara pitched two scoreless innings to close things out. Player of the Day: Although there were many strong offensives performances throughout the system on Sunday, Rafael Devers' stands in a league of its own. Devers' line on the year now sits at .329/.350/.474. He's knocked seven extra-base hits, and he's batting .345 against right-handers. 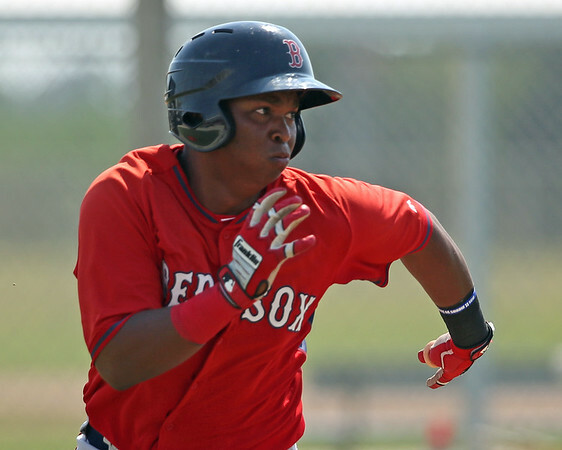 To put into context how impressive Devers' accomplishments so far this season are, at 18 years old, he is 3 1/2 years younger than the average South Atlantic League player, yet he ranks second on the Drive in RBIs and is tied for the lead in batting average, and is tied for sixth among the whole SAL in average.